Pet the cats and avoid feral dogs. It was early evening when Alisa, our B&B host, picked us up from the bus station in Mostar. She brought along a friend for the ride, and within minutes they were laughing about all the tourists they’ve seen precariously stumbling about, trying to sightsee in high heels on Mostar’s cobblestone covered streets. After tossing our bags in our room, we walked out onto those foot-massaging cobblestones, which were glowing seductively Mostar’s lamp lit Turkish old town. Mostar at night, especially off season, is my travel fantasy: a bit exotic, authentic feeling, and—you knew it was coming— it has superstar of a UNESCO World Heritage Site. Stari Most, the aforementioned superstar, is a 16th century Ottoman bridge, destroyed in the war of the 1990’s and reconstructed in 2004. Stari Most is lit up glamorously in the evening and combined with the atmospheric bath of soft lamp light, a stroll through the old bridge area could turn even a rabid pragmatist like me into a temporary romantic. And when we woke up the next morning (in our ridiculously plush and cheap room) we enjoyed this enchanting vista out our window. There were also feral dogs around, two of which followed us about for a bit. While the dogs did not harm us, they were snapping and baring their teeth at each other, and their proximity and our inability to shake them made me break into a nervous sweat. A local gave us the “look sharp” warning, nodding at the snarling pups, which made me even edgier. Do any of you have tips on scaring off feral dogs? I’ve never had this problem before, and I’d like to know how to deal with it if I find myself in this situation again. In fact, we didn’t see any Syrian migrants in Bosnia, though it was pleasing to see that Mostar’s resident’s, many of whom were also refugees in the not so distant past, are welcoming those displaced people currently so much in need. The Koski Mehmed Paša mosque generously allows visitors to climb its minaret. Since we’ve never had that opportunity, we jumped, or rather climbed at the chance. While the climb though the narrow minaret staircase is not something I recommend to claustrophobes, the view from the top is…..aahhhhhh! Just drink in the aqua blue of the Neretva River. Mostar is truly one of those jewel-like beautiful towns, and yet, also kind of unsettling. There are the cobblestones and cozy looking bakeries and then, just around the corner, bomb holes in buildings and graveyards with tombstones all ending with 1993. Unlike Sarajevo, religious tension is palpable. The Muslim Bosnians, mostly in the Ottoman old town, are separated from the Catholic Croatians, in their hipster-modern neighborhood. While I relish religious art in many forms, the giant light-up cross on a hill looking over Mostar’s mosque-dense old city, seems to me more provocative than spiritual. 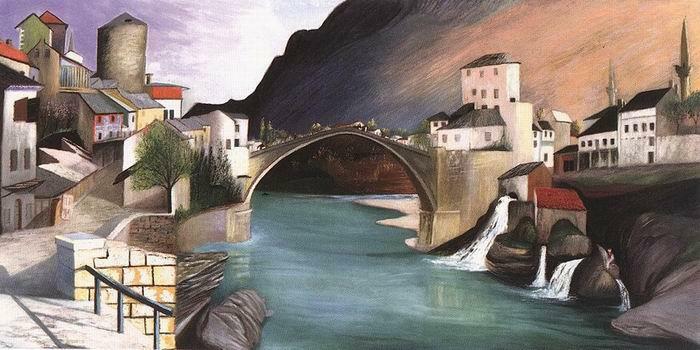 And the tourist industry is oddly just sort of ignoring the ugly events of the 1990’s—-a tourist brochure we picked up just says “The Old Bridge in Mostar is the symbol of the city built in 1566”, completely leaving out the part about it being destroyed in 1993. Interesting places are complicated, so take my advice and spend the night in Mostar. Reconstruction or no, you can’t miss this show-stopping bridge. And don’t forget the practical footwear. How we got to Mostar: bus from Dubrovnik. Where we slept: B&B Marshall. Price: €30.00 for a double. Recommended: highly. Mostar would be the perfect town for a honeymoon, wouldn’t it? My jaw truly dropped at the view from the minaret. Wow. Thank you for sharing! Thanks for reading coffee&twigs. Those muezzin who hike up there five times a day are certainly rewarded with a stunning view! Beautiful city with an edge, would love to visit. Wonderful post! I hope you do go, gracetheglobe. The bus ride alone is thrilling for the stunning geography and the people are lovely and so hospitable. This BnB seems to be great, too. https://en.wikipedia.org/wiki/Tivadar_Csontv%C3%A1ry_Kosztka#/media/File:Cskt-jajcei_vizeses_(1903).jpg We’ll have to go there on our next trip to BiH. Yes, the B&B was perfect, only 30 euro and included a gigantic, delicious breakfast and she picked us up from the bus station too! Thank you for bringing back nice memories about Csontvary! I still remember the moment when I had a series of art books and I had to put the paintings in their proper places on the pages, and his works featured one of these books. The room where you stayed at the BnB is right now 40EUR, if I am not mistaken, but that view is worth a little extra! Who are you to ignore the signs Kaitlin? Go for it! You know, I’ve never seen a bomb hole in person. What a morbid juxtaposition between the natural beauty and the terrible events of the past. I am lucky to live in a place where war has not happened during my lifetime, though there’s a sort of urban warfare in parts of Chicago that is quite distressing. Heading there tomorrow from Sarajevo. Sounds amazing. In relation to the dogs, just go at them. Shout, be big and lurch towards them. They’re conditioned usually to fear humans and just want food. If that doesn’t work then get your kicking shoes on. Mostar is amazing! I just with the images on my sight to better demonstrate, but I guess you’re getting a chance to see it in person right now—lucky you! Thanks for the dog managing tips. Perhaps I should just carry food and toss it to distract them?